We arrived around 9pm on Monday night in Elko, Nevada, after a long drive down a barren strip of road that seemed to go on forever and a day. It was wonderful to see the lights of a city twinkling in the distance as we approached Elko, even if they were mainly casino lights. After a long stint in the desert, we had to be reminded that this was the other thing Nevada is famous for--gambling. We ate dinner at one of the casinos, and had to put up with endless questions from Alex about why kids could not play these games, which looked fun, and didn't cost that much (penny slots abounded). 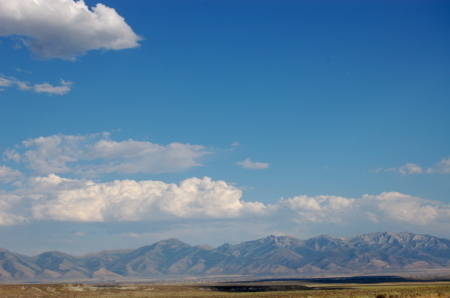 In the morning, we packed up and headed out again, and decided to check out downtown Elko. It's a small, western town with a few storefronts, casinos, and businesses that look faded in the white-hot sun. We found a sushi restaurant around the corner from the Western Folklife Center and decided to try it. It was an odd place, run by young, attractive Caucasian women who all looked more like they should be playing on the US Olympic Beach Volleyball team than serving up nigiri in a dusty cowboy town. Frank said the sashimi was remarkably fresh, but the other food (including Alex's Kraft Macaroni and Cheese) was somewhat tepid. The miso soup tasted like used bathwater with chunks in it. I don't recommend it. 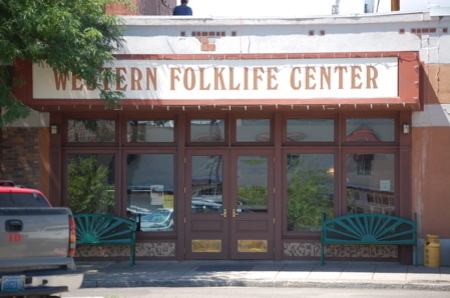 We made our way to the Western Folklife Center, home of the annual National Cowboy Poetry Gathering, and went in to look at the Buckaroo exhibit. The exhibit was a small collection of artifacts and photos celebrating Hispanic culture and its contributions to the cowboy lifestyle in the high desert region. The word buckaroo in an anglicization of the Spanish word vaquero which is what Spanish cowboys are called. You live, you learn. The museum is small, but the collection was nicely laid out, and there is a short film about cowboy life that was in a room that they must also use to store meat in, because it was so cold in there I could only sit through about five minutes without loosing feeling in my extremities. I wandered through the old timey saloon replica and back to the gift shop and left Frank and Alex to watch the movie. We had read about the museum in a guidebook, and it was a nice respite from driving and scenery. The women who worked there were friendly and curious to know how we found them. If you're ever in Elko, Nevada, I recommend a visit to the museum, but skip the sushi. We left Mono Lake after a pleasant hike and photo opportunity, and headed down the long, lonely stretch of road known as Highway 50. This was the first transcontinental highway, named the Lincoln Highway, built in 1915. The highway is known as "The Loneliest Road in America," and after driving for an hour without seeing another car, a house, or any sign of human activity, I knew why. At times like these, you start to long for a glimpse of the Golden Arches, just to know that civilization as you know it exists. 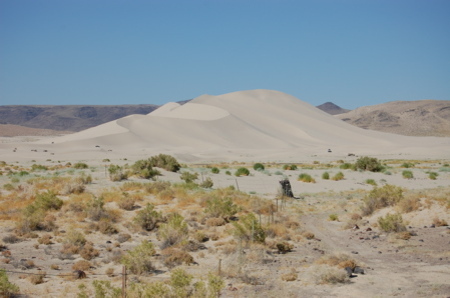 Our destination was the Sand Mountain, near Fallon, Nevada. Alex grew restless in the back seat, and kept asking whether we had arrived in the middle of nowhere yet, and Frank said, "Why yes, I think we have." When Alex asked how we would know when we got there, Frank said, "You can't miss it." After several hours of desert landscape rimmed by far-off mountains, I was astonished to look up and see a big white mountain of sand rising up like a mirage in the middle of the desert. It looked incongruous to the rest of the landscape, like some movie set from Lawrence of Arabia that had been built long ago and abandoned. 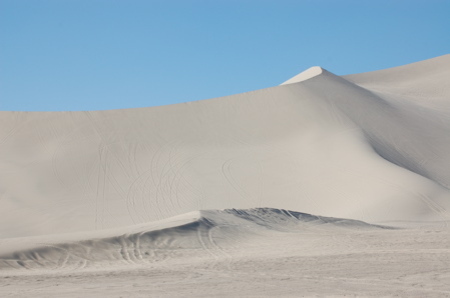 Aptly named "Sand Mountain", it was, in fact, a big mountain of find white sand.